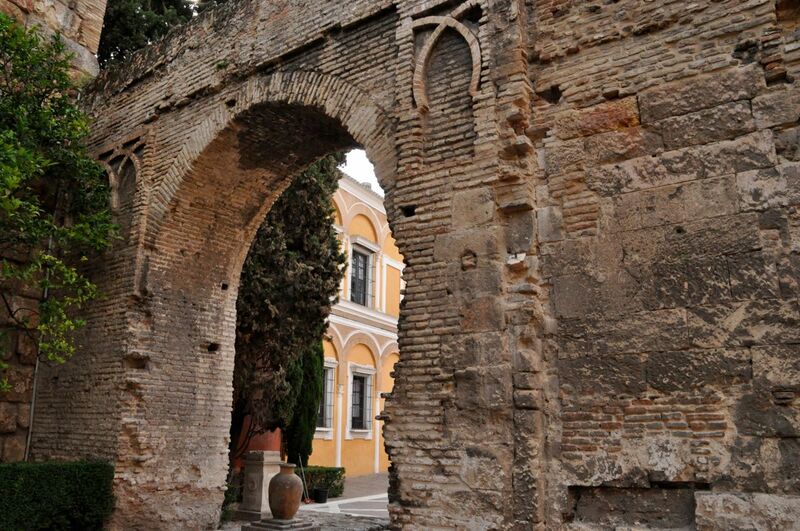 In the 1500’s Sevilla was a gateway to the world with its river harbor; Magellan sailed from here. 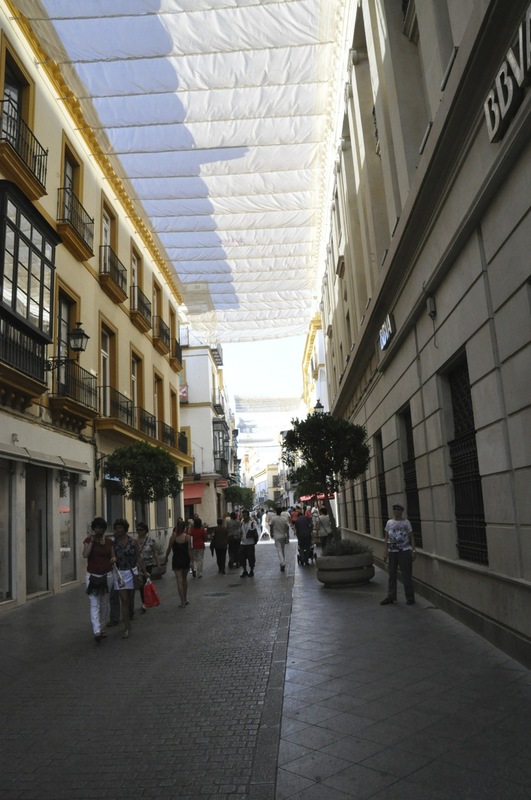 In the 1600’s Sevilla was Spain’s largest and richest city. Today it is a tourist mecca, famous for it’s cathedral and Alcazar (palace),and equally for its “soul”: the flamenco dance, bar life, and maze-like Jewish quarter. 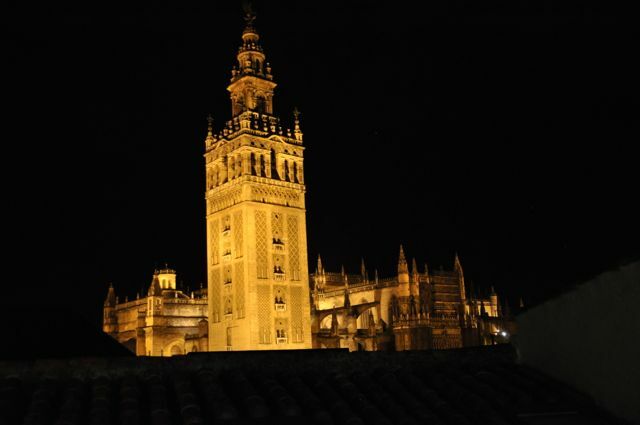 Any picture of Sevilla should start with a view of the Giralda tower, originally a minaret, built in the late 1100’s and now the bell tower for the Santa Maria Cathedral of Sevilla. Actually, the tower couldn’t be supported by the Moorish brick, so the Moors used Roman stone for the base. And the Catholics added the top bell tower. Note contrasting styles! The cathedral itself is fascinating. Some walls and doors still remain from the original mosque, but not much. The contrast between the old mosque and “new” church is shown in the pictures below (taken from postcards, the mosque an artist’s conception). Note the simplicity of the mosque, and its relatively modest human scale; vs the much more vertical, elaborate and complex cathedral. One can see that complexity viewed from above; from the outside, the cathedral is so large I found it impossible to comprehend its overall structure. 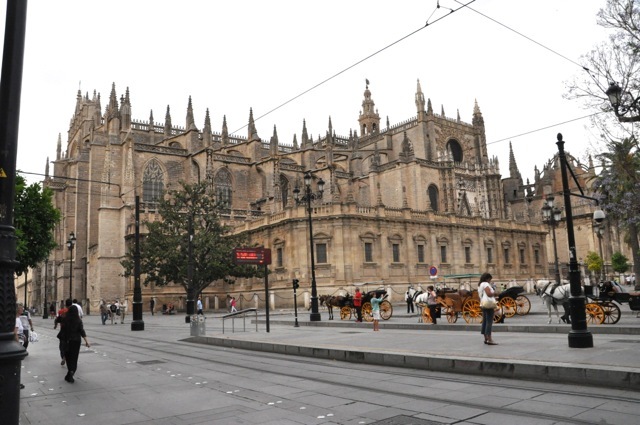 It is the 3rd largest church in Europe, and the largest Gothic church. Note from the postcard pictures that the inner courtyard of the mosque was preserved – as was the entrance gate, a gorgeous bronze-coated door saved from the mosque (early 1200’s) as shown below. Inside, the cathedral is magnificently (and confusingly) large. It goes forever, but there are large structures inside – a choir, a high alter (the largest ever made) – that subdivide the space and work against awe. As seen below, it’s impressive and intriguing, but not elegant. The cathedral has some nice stained glass. Oh, and by the way, Columbus’s tomb is here. Impressively so. 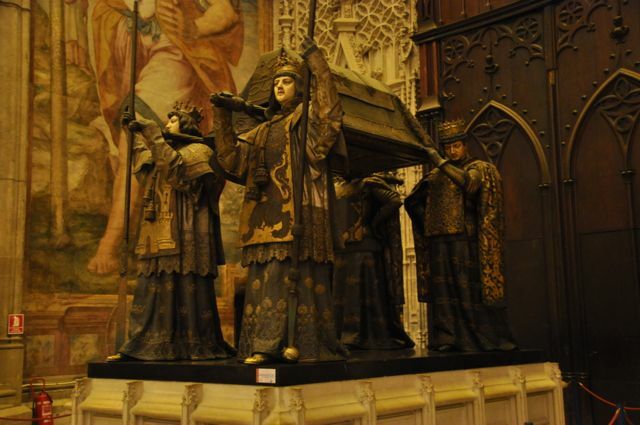 The tomb is carried by 4 Spanish kings, life-size, and is made of gorgeous bronze. It is spectacular. Spectacular in a different way is an incredibly beautiful fresco, painted into a prayer niche of the mosque after the Christian conquest in 1248 (the mosque was used as a church until they tore it down to build the cathedral). The builders were captivated and saved the fresco for us to enjoy. Artist unknown. and hundreds of body parts common to many of these churches. We’re talking major flaunt here. 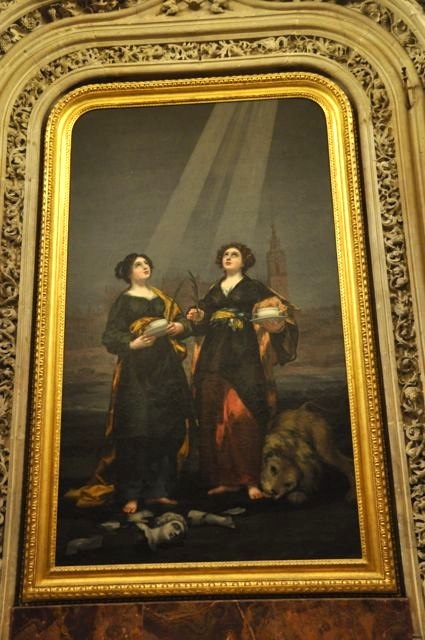 How about a Goya painting? 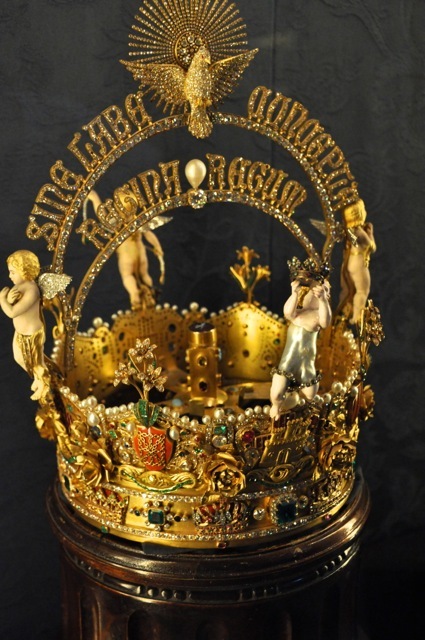 Or among the many many many gold and silver crosses and boxes, this crown? 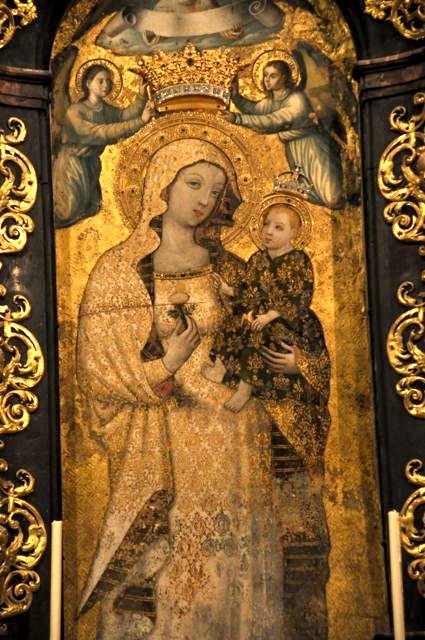 It has 11,000 precious stones and the world’s largest pearl (angel’s silver torso, right). 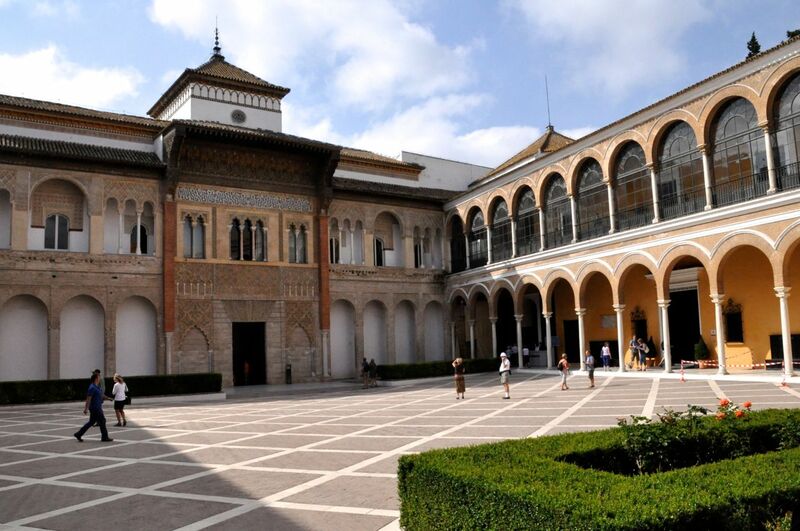 The other major attraction in Sevilla is the Alcazar. Next post! This is about Sevilla. However, I think this entire Andalucian region needs some introduction. So this is going to be long, and talk about history with my novice understanding, so skip to the next section if you don’t want context. 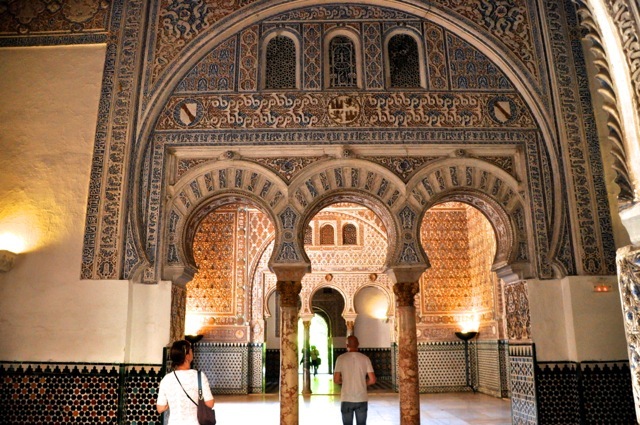 Sevilla was fascinating, especially the Alcazar. Unlike the U.S., there is an enormous strong link between history and the architecture one sees. Especially in Andalucia, where the Muslim and Christian cultures fought so hard during the (400 year long) “Reconquista”. Let this non-historian give you some non-studied history, not because I have any unique insight, but simply because this history/architecture link hits you between the eyes, and can’t be ignored. First came the Phoenicians, for which not much remains, mostly stone walls, and that visible only from excavations – usually inside a building and below ground. We’re talking 6th century BC. Digging foundations for a new building here usually means a delay for an archeological investigation, and the middle of a hotel’s dining room can have a fenced-off section of Phoenician walls. Then came the pagan/Christian Romans, and their visible stone foundations are often a part of the “newer” buildings – not to mention the occasional amphitheater or remaining vertical columns of a temple – or their architectural influences. Then came the Visigoths in the late 300’s, and they were Christian and did more destruction than building, apparently. 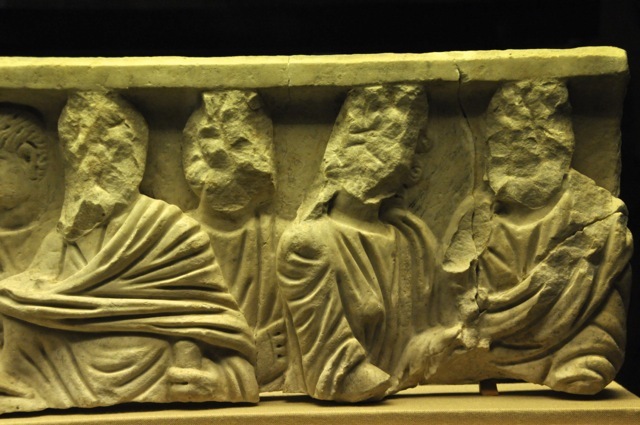 It would appear to this pagan that the primary usefulness of Visigoths in this region of Spain is that of a foil for the Catholic church to argue that Moorish structures are a temporary aberration in time and less important with less rights than the continuous development of Christianity. History here seems to be physical and real with issues somewhat similar to water rights in the American Southwest. 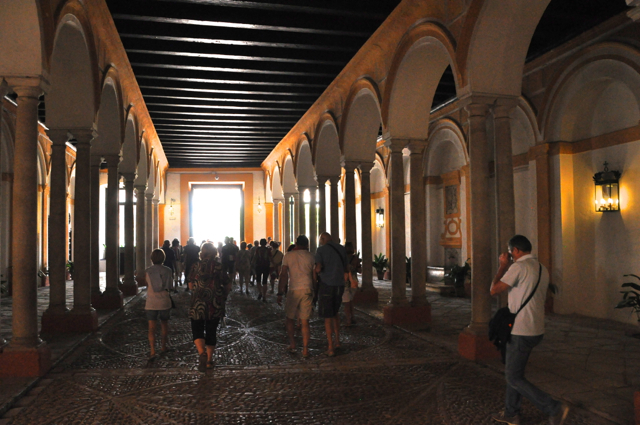 A Catholic church that has Moorish parts runs into discussions when alterations are desired. Anyway, back to my story. The Visigoths were nomadic and small-village people, and when the Moors swept in from Africa there was not much resistance. Coming from Africa, the Moors were enthralled by all the water they found; and on the Roman foundations they built incredibly beautiful – let me repeat, incredibly beautiful – structures. After, of course, leveling Christian churches and knocking the faces off sculptures of humans since the Koran doesn’t like that. And the Koran says to wash up before entering a city or church, so water was piped to plentiful public and private baths, as well as patios and fountains and gardens. 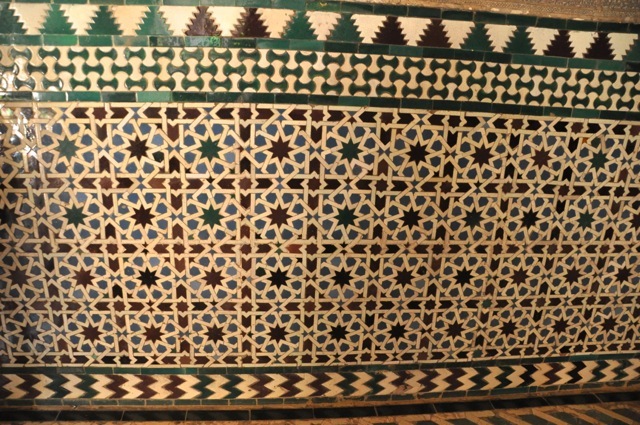 And the spaces, decorated without depicting animals or people, are very geometric and intricate, seldom repeating, and are everywhere, providing a jaw-dropping feast for the eyes and a tranquility for the soul. 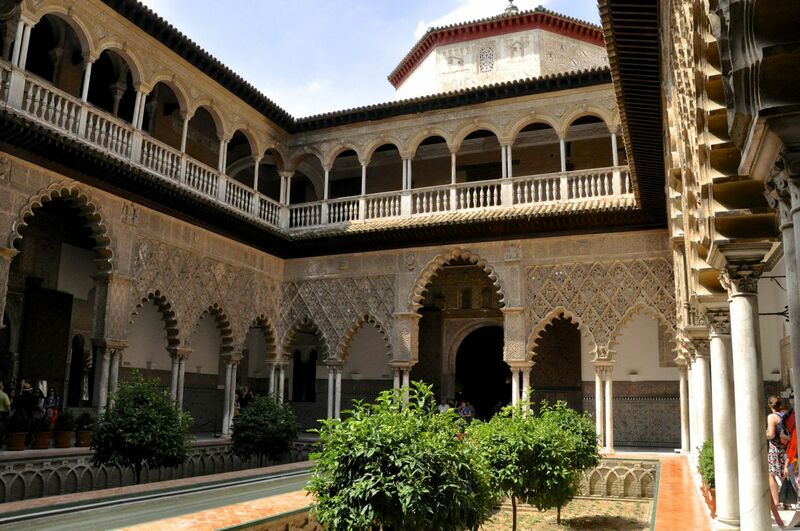 The Moors came to this region of Spain in the 700’s or earlier, where much of the architecture we see was begun. 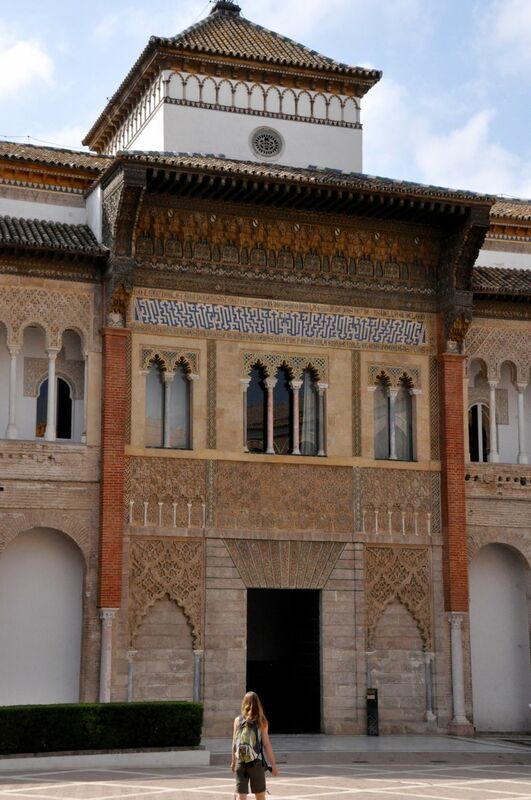 Moorish kings got really wealthy with trade between Africa and Europe (and their own silk business) and built fabulous palaces (and needed fortresses). A lot of this really beautiful stuff was built between the 1200’s and 1400’s. So we’re talking about use and re-use for 500 years or longer, without much sprawl (being close to the fortress had some advantages for survival). If you’re doing any historical restoration, it’s hard to know at what time point you want to go back to. Anyway, as Europe trudged through the Dark Ages, Moorish magnificence and intellectual thought bloomed. And it’s still here to see! And then came the Reconquista, and Christian Spain North got united (with Austria) and began reclaiming the peninsula. It was slow going for 400 years! As Muslim city after city fell, the victorious Christians, having lost many lives, wanted to make a statement to remaining residents, and typically leveled the mosques and built YOU’RE CHRISTIAN NOW! churches that are pretty in-your-face. 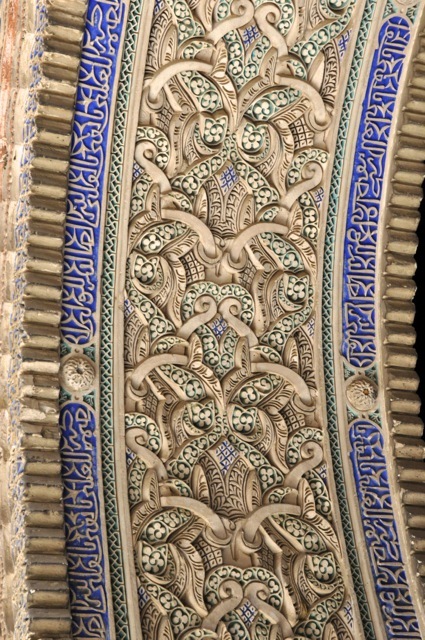 Except where the Moorish mosques were so incredibly beautiful that they couldn’t in their hearts tear it down. So some of it is preserved. In Cordoba they built this humoungous Catholic church smack in the middle of the mosque, preserving a bunch of the mosque, but we’ll get to that in another posting. What one sees today is a striking juxtaposition of this beautiful Moorish poetry in architecture, with typically bombastic Catholic architecture that took a hundred years to build (thus incorporating all the successive architecture in vogue, Gothic to Renaissance to finishing touches in Baroque), gilded in gold, big and ostentatious. Today what one sees is remnants of the Moorish world starting from 900 or so, the older stuff typically walls, Moorish baths, and water-delivery systems (see Ronda), with that same or nearby space occupied by a subsequently flourishing Muslim world until the late 1400’s (and amazing parts of that world of the 1200-1400’s still preserved). Let me show you some of them in subsequent posts! We continue to have difficulties with the newer technologies of the Garmin and iPhone. Now I confess that Ginger is the operator of the Garmin and owner of the iPhone, but I doubt I would do any better. Neither of us have had much time to play with them! Our Garmin asks first for the street we want, and then searches for every street in Europe by that name. We then scroll through thousands of hits for the one in the city that we want. Strange. It also tends to turn itself off somewhere in the middle of the drive; the little lady inside goes to sleep for some reason. The last episode was a real disaster. I bought an adapter for the car that pushes into the auxiliary power hole; then the Garmin taps into that with a USB connector. So using it into Jerez, it kept telling us to turn right when we knew that was wrong (wrong input address?) so we ignored it and got to where we wanted. Then on the way to Sevilla (same day) it was working great, until we got to the outskirts of Sevilla when it died from lack of power – while plugged into the car battery! Not sure if the problem is the car or the auxiliary power adapter or some combination (I bet the new adapter). Anyway, just when we needed it the most, it was useless. Ginger has an iPhone (Google Maps), but the previous day it went into a non-working “no service” mode. And did I say we didn’t have a map of Sevilla? Our Michelin map didn’t show a city blow up. 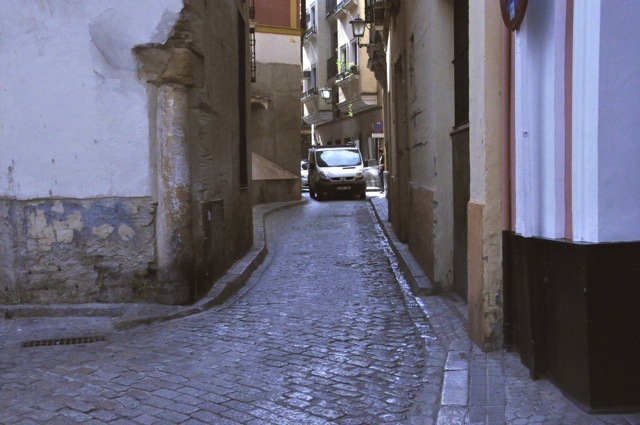 And did I say that our hotel was in the barrio of Sevilla with medieval tiny winding streets, all of them seemingly one-way the wrong way? I had written street-by-street instructions to the hotel on a small piece of paper (not trusting the Garmin completely yet), but it turns out the street names are not on many corners, the names change over short distances, and Ginger can’t always read my writing. So getting on the major loop around Sevilla, (I’m the driver, Ginger is the navigator) Ginger says we’re looking for exit 813 (earlier we had seen a sign for 803) but after driving awhile we couldn’t find anything remotely close to 813. When I stop to look at the notes, I notice that we’re NOT looking for exit 813, my handwriting says exit 8B; that misleading 803 number that we had seen was a road name, not exit number. Well, then things really got bad when we hit the barrio. One-way streets are everywhere. And worse, they’re one-way for a reason! We’re talking medieval here, designed for horses. Skinny poorly fed horses at that. Heck, in some spots two horses couldn’t pass. Maybe if they inhaled hard. My notes take me through horrendously tortuous and narrow streets (I’m sweating bullets; this is a rented car, and my mirrors are inches away from scratches, and there are right angle turns that look impossible); and then we’re nowhere known, and by mistake I drive over a plaza where there is no street (no one seems to care, his must happen a lot), and we’re totally lost but no worry, there are no options, only one-way streets. Travel on. Finally we come to an intersection – a busy one, 4 lanes! – and lo, we are back on the street we had started from, some roundabouts earlier. And did I tell you that on the regular streets there are roundabouts with 4 lanes going into 3 lanes on the roundabout and then 2 lanes on the out-road with cars jockeying for position along with motor cycles buzzing in and out while we’re looking for street names? Nothing is easy. So back into the barrio we go; same problem, so I called the hotel (the operator doesn’t speak English well) and we are told to take this street and that (the last one we can’t find). So we loop again, and call again, and after answering, our operator lifeline puts us on hold. Well, I’m in a one-way street with a foot on each side of me between stone houses, and cars piling up behind me, so waiting is not a good option! So I turn into a (wrong) street, blocking it but nobody behind me, and ask directions. Bingo! I’m a street away, and just need to make a left (actually, that’s squeeze a left) and I’m there. Above are two pictures of the road to the hotel. Don’t think this is the worst of the streets! Many are this small at some point. The pictures show the road and a sidewalk on each side. Both the roads and the sidewalks vary in width – small and smaller. On the smaller ones like this, when a car comes (which they do often), one has to duck into a shop’s doorway. Learning: do not book a hotel in the barrio. We parked our car in a separate tiny tiny garage under a house, holding about 5 cars. After going down a ramp and turning 90 degrees right, one could only back into the allotted space. Getting out, however, seemed much harder. Did I tell you the cement ramp was like 60 degrees up? Seriously. Attached to the wall on one side and totally open on the other. So one had to negotiate that 90 degree left turn, turning hard so as to not hit the right rear view mirror on the wall, goose the engine like crazy to get up the ramp (standard shift, clutch), while sweating bullets that the left rear tire would not fall off the ramp edge as you made the turn. That would be bad. 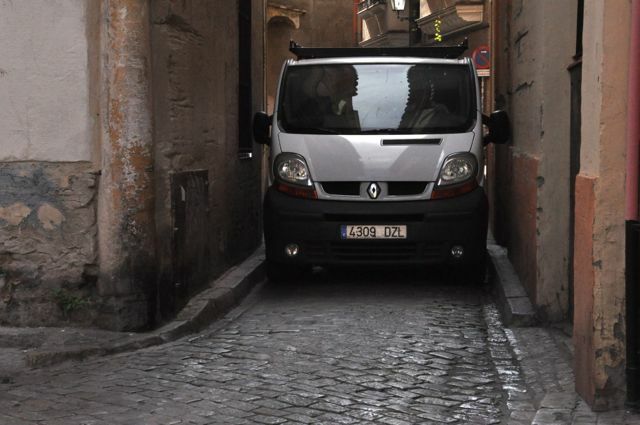 Then up the ramp one could not make the turn into the one-way street, so you had to go the wrong way to a nearby y-intersection and see-saw back and forth until the car could turn around, again risking mirrors against walls. Tough! Learning: Public transportation is looking better and better!